Chintan (2009) defines report may be defined as a formal document based on collection of facts, events and opinion and usually expresses a summarized and interpretative value of information. It can be defined as communication in which a person, who is assigned the work of report making, gives information to some individual or organization because it is his or her responsibility to do so. The word ‘report’ is derived from the Latin word – ‘reportare’ – means to bring back. 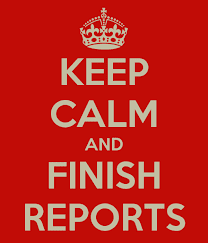 A report is a statement of the results of an investigation or of any matter on which definite information is required. (Oxford English Dictionary) Reports are a highly structured form of writing often following conventions that have been laid down to produce a common format. Structure and convention in written reports stress the process by which the information was gathered as much as the information itself. b. An informal report is generally in the form of a person to person communication. It is brief report of a specific business. Laboratory reports, daily production reports, trip reports are informal reports. c. Routine reports are prepared and presented at regular intervals. They may be submitted annually, semi-annually, quarterly, monthly, weekly and daily. Sales and production report, cost report are examples. f. Written report is presentation of data/information in written form. They can be kept as permanent record / can be edited, reviewed and stored. g. Information report is presentation of data/information without any analysis or interpretation or recommendations. Conference report, seminar report and trip report are example. h. Analytical report is presentation of data/information with analysis or interpretation or recommendations. Project reports, Feasibility reports, market research report are examples. Weekly report is record of work which can encourage learners to report whether they study in self-access learning center, in laboratory , or in computer using internet, and how many times they have studied there (Husain, 2003: 102). According to Etkina (1999), a weekly report is a paper that students write analyzing and reflecting on what they have learned. · Obtain useful feedback for reorganizing course content. · Gain insight into how students think about their own learning (“metacognitive processes”). Belum ada tanggapan untuk "WEEKLY REPORTS IN TEACHING WRITING"